"K+R", "Webbing"' vow, Suspended 400 Feet Above a Canyon in Utah. Professional Slackliners mostly know as K+R in their profession 'Kim and Ryan', are specialised in highlining, (a sport similar to tightrope walking). 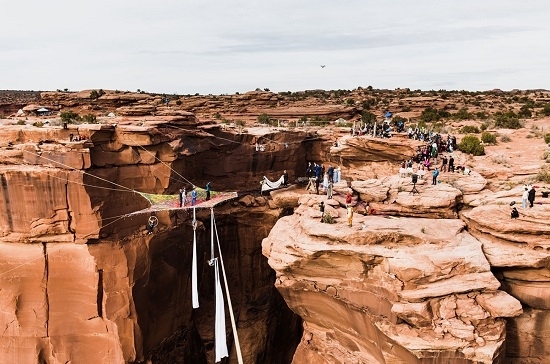 The duo met in a slackline festival at Utah and fell in love with each other, after a course of dating when the couple decided to marry the theme and venue they chose was like they wanted to celebrate their passion soaked in creativity. Kim and Ryan took their wedding 'to which they called, "Webbing"' vow, Suspended 400 Feet Above a Canyon in Utah. The couple who shared their "I do", moment over Instagram shows that moment of their life was all loaded with creativity and planning leading to a crazy marriage.